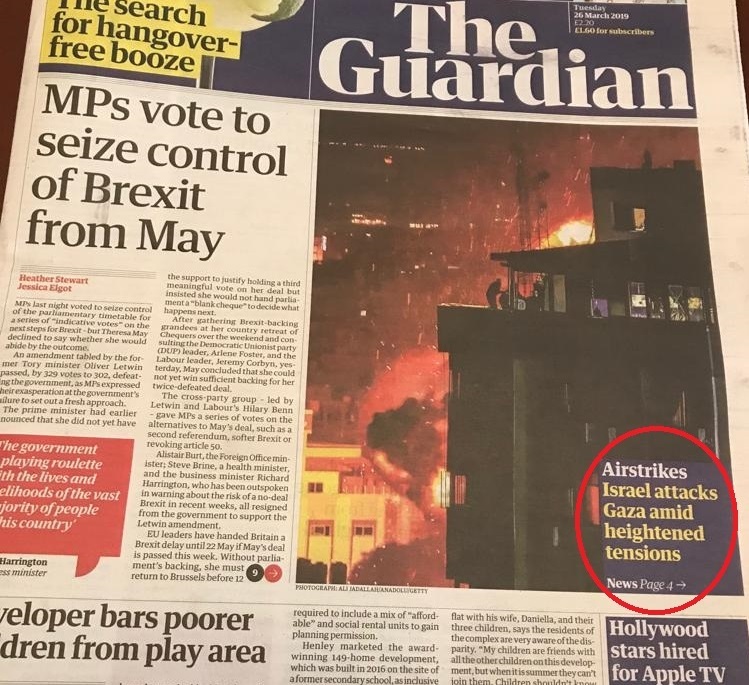 First, note that the Guardian cover story on Gaza leads with “Israel attacks Gaza”, whilst failing to note that the latest violence began when a Hamas rocket hit a home in central Israel yesterday, injuring seven family members. The vague wording “amid heightened tensions” obfuscates the initial Hamas attack. In contrast, the actual article includes the accurate headline “Israel attacks Hamas terror target after Gaza rocket wounds seven near Tel Aviv”. Surely, some version of this accurate causation could have been included in the cover headline. Also. note the curious editorial decision to feature the article, accompanied by a large photo of an explosion in Gaza, on the top half of the cover page, and placing the article itself on page 4, despite the fact that there have been no deaths on either side and IDF attacks have only hit Hamas military targets. 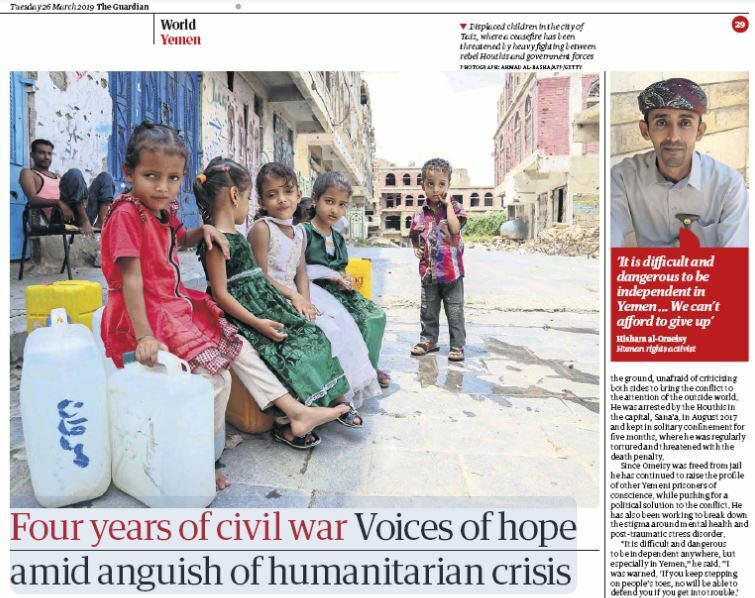 In contrast, a story in the same print edition on the massive humanitarian crisis arising from the bloody four-year Yemen civil war, where, for instance, more than 85,000 children have reportedly died of starvation, appeared on page 29. Is the Israel-Hamas skirmish truly the most important story in the world? Though, perhaps, it could be argued that the importance of the story to British audiences is heightened by the fact that the rocket hit the home of a British-Israeli family, the actual article only mentions this detail in the seventh paragraph. 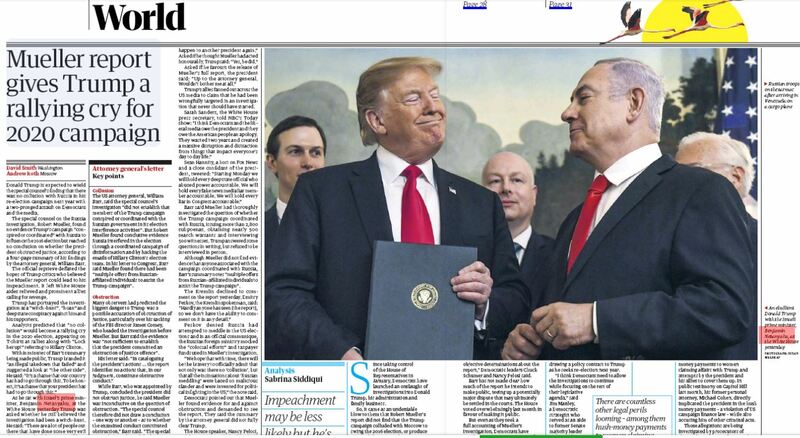 The photo showing Trump meeting with Netanyahu at the White House yesterday, and holding the Golan Heights recognition proclamation (with Jared Kushner, Jason Greenblatt and Ambassador David Friedman), is notable because the prime minister is only mentioned once in the two pieces, and only in passing in the seventh paragraph of the first article. There’s nothing in either article about the Trump-Netanyahu meeting or the Golan recognition, and you’d certainly think that a stand-alone photo of either Trump or Robert Mueller would be more appropriate. Der Guardian has Hebrew blood on its pages. Sign up to the newsletter . It is very good. The Guardian has decided that Israel is the aggressor, since as a Jewish state it is obviously richer than other states with ill-gotten wealth derived from having an indecent amount of brains. On that basis it has to be kept in its place. It’s just Jews who are attacked as far as The Guardian of Propaganda is concerned. It’s far more egregious that Israel destroyed an empty Hamas office.